It is insane to me that we are only a year removed from the Senators coming within a game of the Stanley Cup Final. It is insane to me that so much has happened between then and now, including this and this but mostly the team’s threats to leave Ottawa and the team’s simmering contract beef with all-world face-of-the-team Erik Karlsson and the team’s general cheapness and ineptitude and, overall, the seemingly nonstop walking disaster that is owner Eugene Melnyk. 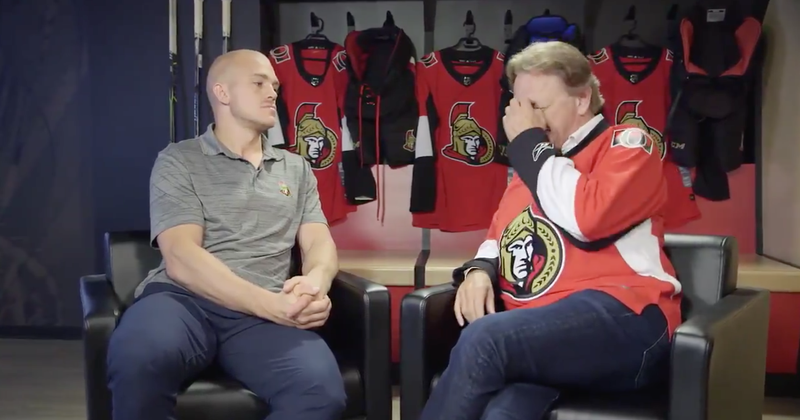 It is insane to me that Melnyk would decide that what loyal and long-suffering Senators fans wanted more than anything was to hear from him, let alone in a six-minute sit-down interview with third-pairing defenseman Mark Borowiecki. It is insane to me that this video exists, and this video is insane. I feel insane. This team will do that to you. It’s a long answer, part of which includes the acknowledgment from Melnyk that “we’re kind of in the dumpster,” which is rarely a thing you want to hear from your owner. In generalities, Melnyk says he’s gonna blow this team up, and that the rebuild will take two years. It’s going to be severe and immediate—Melnyk predicts 10 rookies will make the roster out of camp. The Senators are going to suuuuuck. But, this video accurately conveyed the Senators’ plans even before anyone said a word, because: Mark Borowiecki. If you are a casual fan, you have probably not heard of him. That’s because he’s not one of Ottawa’s shall we say good players. So why is he hosting this video? Well, all of those good players—Karlsson, especially, but Matt Duchene and Mark Stone also—are not going to be on this team for very much longer, and everyone involved knows it. Hey, this video wasn’t all things everyone knew. Melnyk said he’s not moving the team! “Some people are talking in town, ‘ah he may move the team,’” he said. “First things first, is I am going to stick around here for a long, long time. I’m not going anywhere. Number two, the franchise is not going anywhere.” Some people are talking in town. The only person who talked about moving the team was Melnyk! And he did it right before the NHL 100 Classic, the outdoor game to celebrate the league’s centennial, farting all over his team’s big moment in the spotlight. Anyway, all of this is messy in a specific way that only the Senators can achieve, let alone maintain, but a rebuild is a good thing. This team does need to start from scratch. Yet I can’t help contrast this to how the Rangers went about announcing to their fans that there were going to be some tough times ahead, both in the method of the announcements—the Rangers released a letter from the president and the GM—in in their respective fanbases’ confidence that there is actually a light at the end of the tunnel.